The Watsonville Sloughs are a highly valued and unique freshwater wetland resource on the Central Coast. The Slough wetland complex has been modified significantly over the last 100 years, both in size and function. Agriculture and urban uses have encroached on wetland boundaries, portions of the system have been drained to allow farming, and urban development encircles the upper watersheds of three principal sloughs in the six slough system. There are significant draws of deep groundwater to support these activities and there are subsurface drainage structures that discharge shallow groundwater back to the sloughs. Many hydrologic control structures have been installed on surface waters throughout the watershed, including pumps, gates, culverts, bridges, and road crossings. Many of these structures modify the rate at which water flows through various portions of the system, dewatering habitat in some areas while contributing flooding in others. In addition to these control structures and extensive upstream/upland development, recent conversion of highly erodible rangelands to strawberry production has led to further modifications of the hydrologic system with elevated erosion rates resulting in deposition of fine sediments into the sloughs and drainage systems. With these changes, and because of the system’s hydrologic complexity, local planners, policymakers, and conservationists have been seeking a means to better understand the hydrologic function and the potential effects of possible future modifications in and around the sloughs. 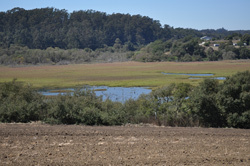 Funded by grants from the California Department of Water Resources and the State Coastal Conservancy, the RCD and its partners recently completed an extensive hydrologic study of the Sloughs, with technical and oversight support from a steering team composed of local stakeholders and academics with a history of engagement in resource management and data collection in the Watsonville Sloughs watershed. Understanding how water moving through the sloughs may provide opportunities to enhance habitat, water supply and quality, and flood management. The complete Watsonville Sloughs Hydrology Study which includes the results and conclusions from the study, as well as recommendations for future work to refine the models and better understand the functioning of the Sloughs, can be found on the RCD website. Both the RCD and the Pajaro Valley Water Management Agency will retain electronic copies of the model for future use by local agencies, partners, and planners for projects including enhancement of water supply, flood management, ecosystem restoration, water quality, and recreational opportunities.